An Eclectic Technologist/Artist who loves improving the quality of products, processes and personal development who also specializes in beaded, paper, fabric and mixed media craft. I own my own Consulting Technology business, have three distinct Facebook Pages (one for Beaded Craft, one for Paper Craft, and the last for Supplies), as well as have a Spirituality page and group called Inner Dimensions and a Diversity and Inclusion page called For Alliances. I have decided to blog about creating my new studio at our new home in Cleveland Heights. I felt it was needed, and I want to capture the experience of creating a workable, creative, friendly, fun studio in our basement. This is yesterday's Facebook post, but now I am going to document things here so I can add pictures and details with formatting!! I didn't get to go downstairs today - it was 14 degrees outside and that was a wee bit chilly down in the basement. I started looking over the stuff I've washed, started organizing things that are going downstairs. I have many many projects in my trello board - most are just one or two sentences. I plan on doing a lot of upcycling, re-claiming, creative usage of old furniture from tree-lawn diving. After that my first project is to sort the boxes into their areas. Then get my beading station and fabric area up and running. This year I have decided/accepted in 4 Holiday faires, and to host 2 open house parties. I am excited, scared, nervous, worried, frantic, optimistic at the same time pessimistic but all of this rolled up into - I CAN DO THIS. Here is this upcoming schedule - I look forward to seeing folks, stopping by and buying something - And if you say you saw this on my blog you can get 15% off your purchase. We look forward to seeing you at these fine Holiday Faire events. I've been following piece by piece my own passion of becoming a known Artist, crafts-person, as well as at some point want to open up an Institute to preserve and teach historical bead, paper, sewing craft techniques. Focusing on low to middle income folks who want to get into a trade. I've known the Williams family since 1997. I have watched Elizabeth (Bear as she was called in the earlier years) grow up to be one very amazing person (thanks to her parents Cat Williams and Matt K Kringle Williams and her sibling, JA, Amber, Joil, Bryin, Cartwright). Elizabeth has always had a passion for caring for animals, and a gentleness that I have only seen in a few folks when it comes to all animals. It her life goal to be a Veterinarian. I know my daughter Chrystiana Lynn wanted to do that, and it is NOT cheap. I also know how long and hard road to achieve. Elizabeth has a lot of hurdles, Sciences, Math, Medical school, all ahead of her to achieve this goal. But, like her parents - she is a feisty, tenacious, determined young lady. The Williams have always been a generous family, opening their doors to strangers, adopting an entire set of siblings who lost both their mother and father in a short period of time (They were exchange students), helping others out when they lost everything with Katrina, the list goes on. They believe, like I do, in pay forward and it shall return when you most need it. Last few years - the Williams have experienced a serious life changing set of events, including Matt's heart attack. Both Matt and Cat are working towards their degrees themselves, making another great positive contribution to society with what they plan on doing with their degrees. But the money is extremely tight with them. And because they had no insurance = they are still paying off Matt's medical bills. Thanks to the twinkiness of the government, Elizabeth's funding for her college education took a significant south turn. This has jeopardized her starting this fall and being able to even continue. If some clown can get 55k for wanting to make potato salad, all because of social media passing around, and the link went viral, I figured why not see if we can get this to go viral! I know there are those who will help contribute to something far more reaching, far more important, strangers out there who believe the same - Pay forward and this definitely is something that Pays forward. Help us Help Elizabeth fulfill her dreams. I love making this one. Though it was a good one to have, still a shock. It all started because I needed to clean up my tags on my listings on Etsy. Right now I have 172 items active up in VampkittyDesigns and you know I have been very proud of getting that many posted. 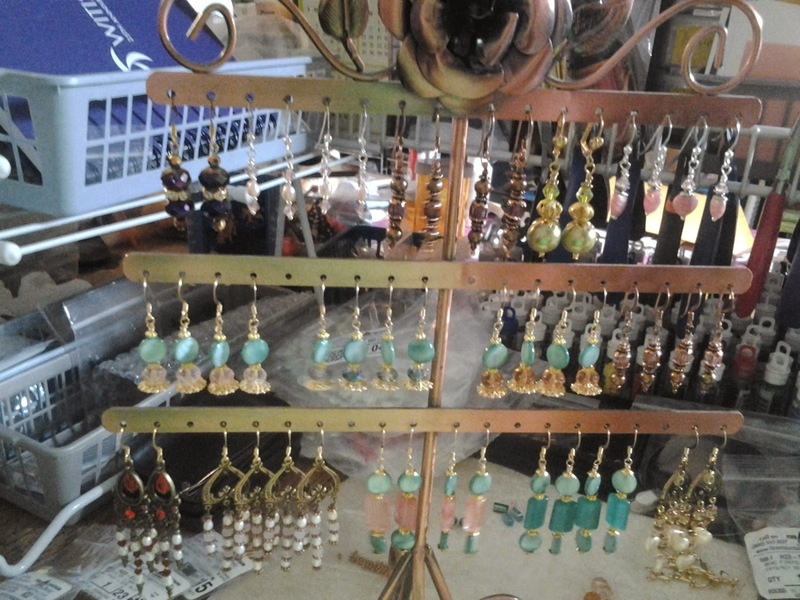 I still have a lot of necklace sets to take pictures of but managed to get the majority of all the earrings I had made up on the store. But thinking of adding 1 new tag to 172 listings, well I wasn't thrilled. Did a bit of research, downloaded the free trial version and fell in love with BEtsi. This new tool is the BOMB to help me with my listings on Etsy. I found it not only adds Tags in bulk, I could clean up, re-organize, find my misspelled tags, and standardized on verbiage used in tags. And I did that in less than 3 hours. I haven't tried the other parts of the tool yet, but suffice to say, this just saved me hundreds of hours. Anyway back to my reason for the posting. One of the features it has is to tally up quickly your stock and how much inventory do you have up in the Store, the fees (Etsy and Paypal) and net worth. That was the shell shock. Only $6,000+ dollars of merchandise is up in the store. That is NOT going to work... not at all. 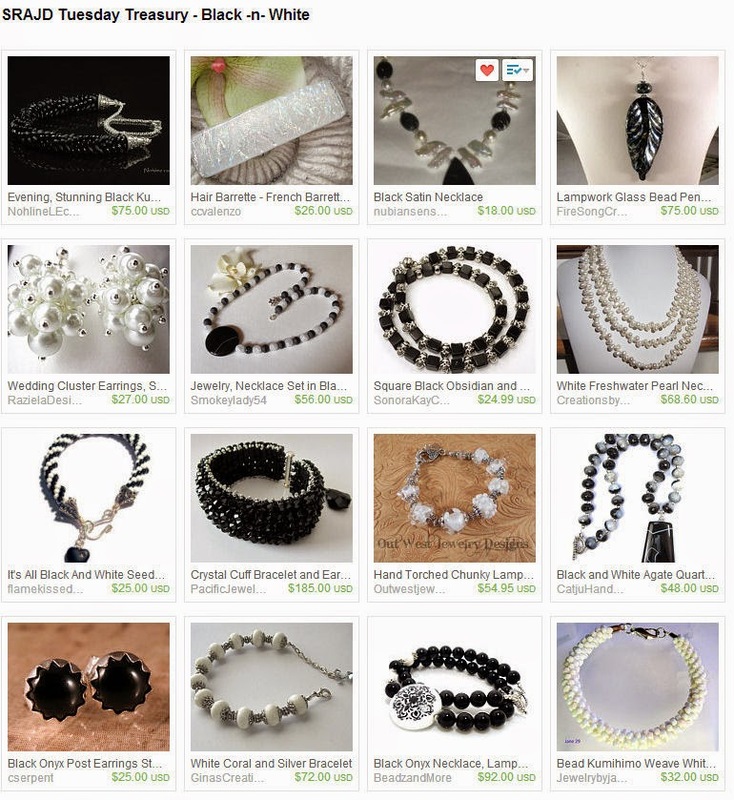 So it is scramble to make more and get the remaining necklace set backlog cataloged, pictured and posted. I never had considered my designs Vintage, but looking over some of them, I can see how they could be considered Vintage. - It was a nice feeling to see this, this morning. 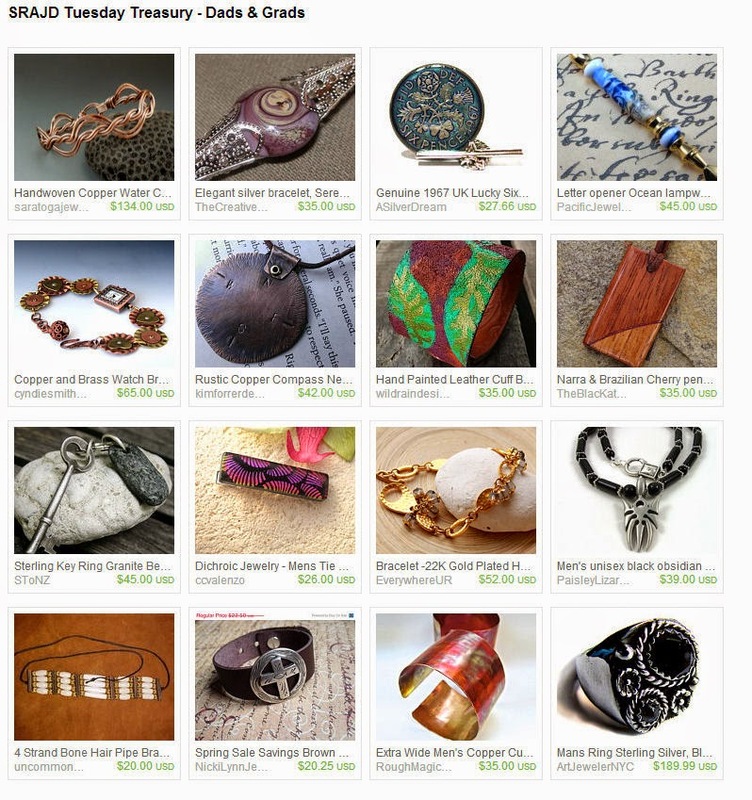 Speaking of Treasuries - it is Tuesday, meaning my weekly SRAJD Etsy Treasury. This one was a bit of a challenge, since I wanted to do something that hadn't been done in a long time. Looking over the SRAJD Treasuries Pinterest Board, I realized a very basic combo hasn't been done in a LONG while. These are all amazing designs. Very inspiring that is for sure. Speaking of designs - SRAJD has a lovely contest each month - themed designs. I am working on two pieces for this months' design. But the competition so far is TOUGH. This is just this month so far for entries. 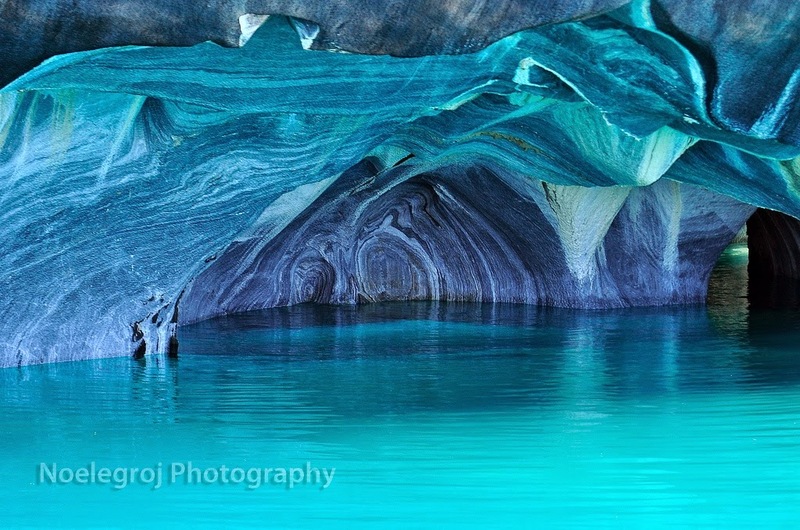 I have an idea for June 23rd Angkor wat, Cambodia and one for June 30th Marble Caves, Chile. I will post later today on both these ideas and sorta a working journal on how to become inspired - but in the mean time these are the two pictures that are inspiring me for these two weeks. Hopefully these two pictures will help guide me to what I want to do. I have most of the components for the first one. Today I am looking for the components for the second picture. 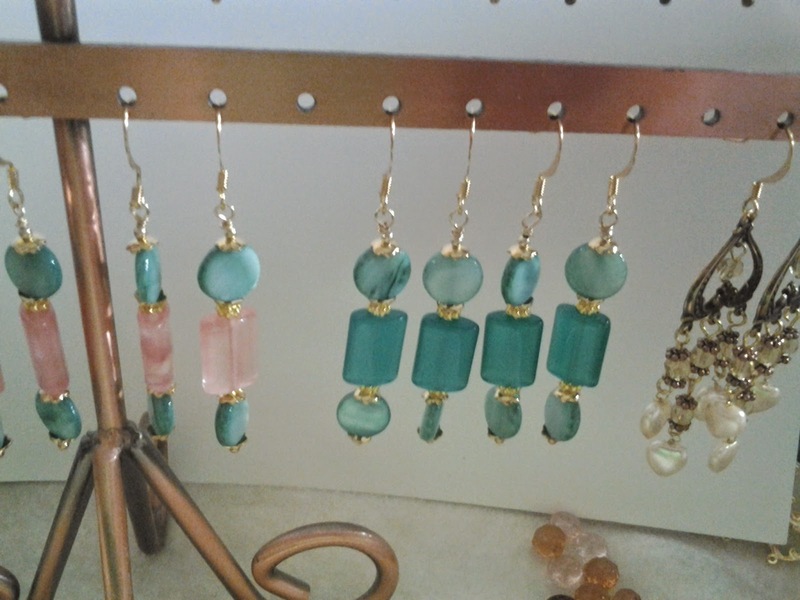 Either Agate or Carnelian for the Orange, Aventurine or lampwork green for the other main color. 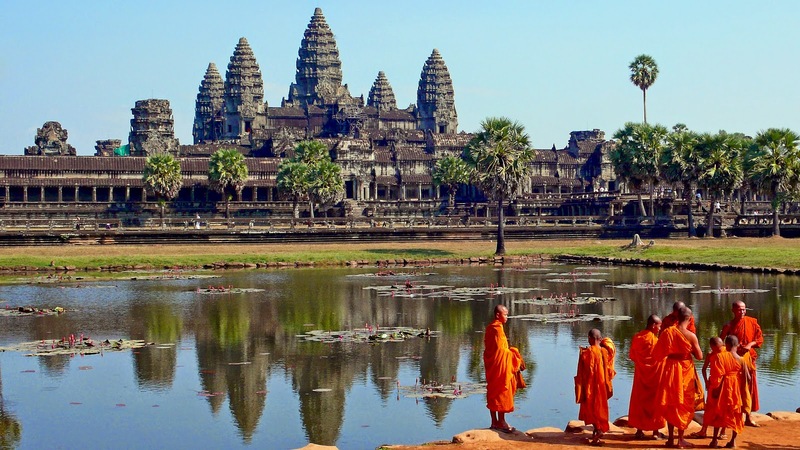 I have the temple pieces in antique bronze. It should prove interesting. More in my next blog entry. Etsy Treasuries are fun. I think I enjoy just looking through all the beautifully handmade designs, be it jewelry, lampwork, metalwork, papercraft, sewing, you name it. 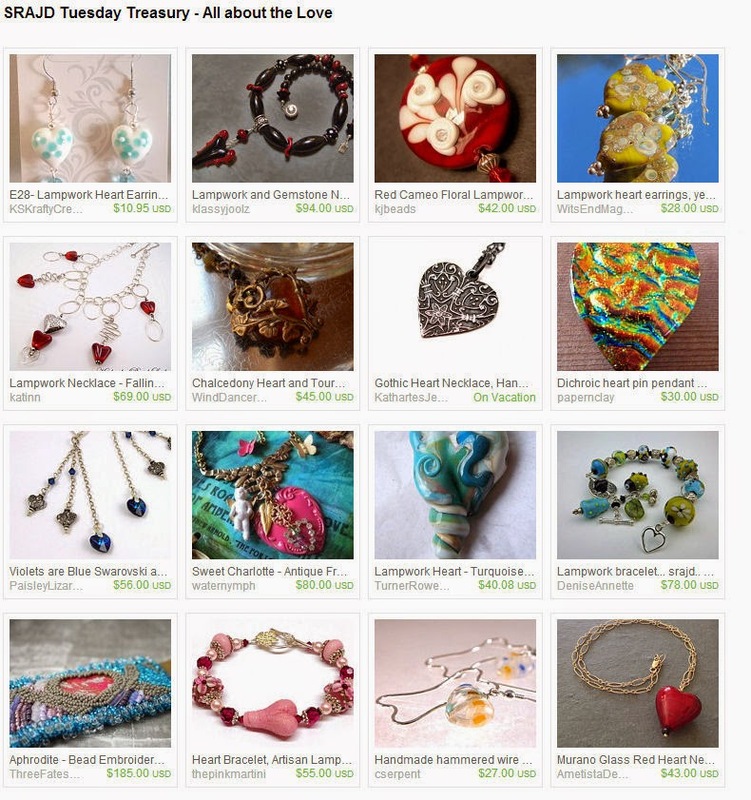 If it is handmade, and pleasing, I like making treasuries around them. With that, being the Captain of an Etsy Street Team (SRAJD Etsy Street Team) we as a group make all kinds of Treasuries to promote the brand, the individual artists and themes. 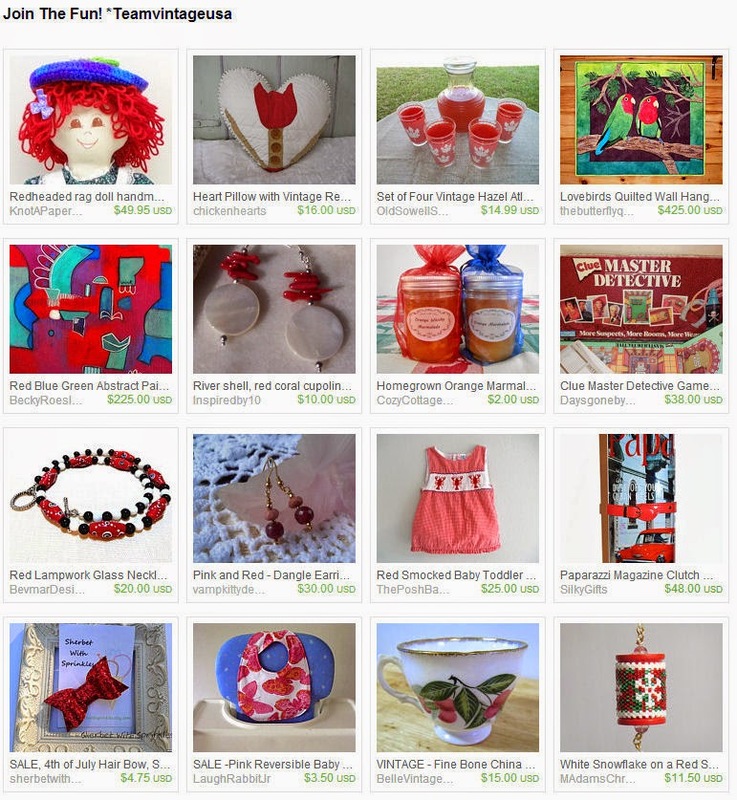 I do Tuesday Treasuries each week. 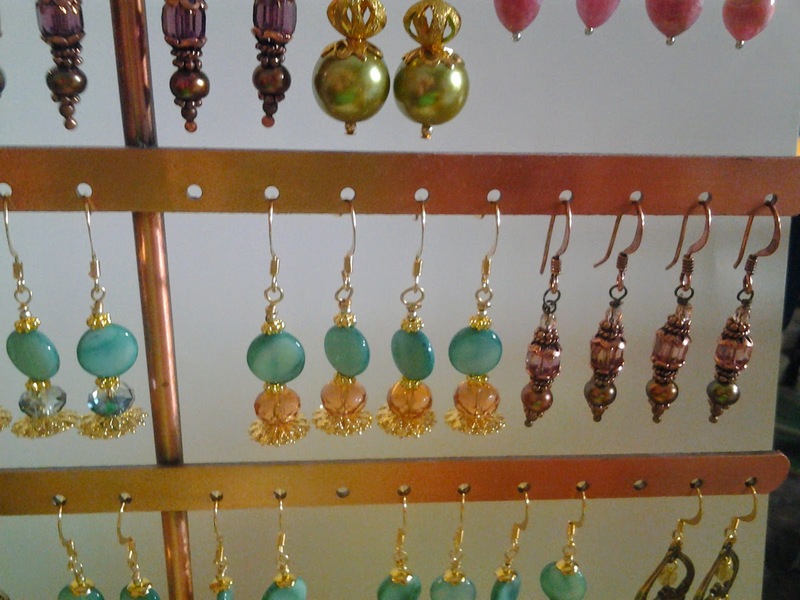 Check out our other SRAJD Treasuries. We have a lot of wonderful artists/designers. It's a Bead-iful World ! All rights reserved - Designs by Vampkitty Designs / Vampkitty Ala Card- 2014. Simple theme. Theme images by caracterdesign. Powered by Blogger.